This is it, friends. We’ve crawled every dungeon, found (almost) every Big Key and collected all of our Go Mode items, so nothing left to do but climb Ganon’s Tower, make short work of Agahnim (again), and skewer The Big Pig himself, Ganon. So that’s just what timp, Axeil, and Hurfydurfy do in this episode! But not before timp describes his first experience with SMZ3R and Hurfydurfy brings us a juicy aLttP rumor to mull over. Plus: a Fetch Question! 14:45 – Official Nintendo Rando? With all seven crystals in hand, timp, Axeil, & Hurfydurfy climb up Dark Death Mountain and open up their final dungeon, Ganon’s Tower. This time they isolate the ins and outs of the infamous Big Key Hunt, but not before a quick Auto Tracker update and a shout-out to the hottest & newest community tournament, ALTTPR League. Plus some Fetch Questions! With every intention of talking about Ganon’s Tower, the Go Mode Crew finds themselves nearly an hour into recording with only one topic discussed: the aLttPR Admin team’s sudden endorsement and subsequent reversal of aLttPR community member EmoSaru’s auto tracking software EmoTracker. timp, Axeil, and Hurfydurfy thoroughly dissect the events surrounding Feb. 24 & 25, 2019 and share their opinions, then round things out with a Fetch Question and a puzzler from Qirn’s Qorner. Seriously, there’s really no need for timecodes here! They just talk about the auto tracker thing for pretty much the whole episode! timp, Axeil, & Hurfydurfy prove that they know about a few games that aren’t aLttPR in some pre-show banter, but don’t worry—they quickly switch to discussing the conclusion of the Fall Tourney & Challenge Cup, then enjoy an in-depth discussion about a new aLttPR mod called ReLink. FEATURE: The Go Mode Crew finishes out their dungeon round-up with the Dark World’s final crystal dungeon Turtle Rock. 15:25 – What is ReLink? In a consummate return to form, the Go Mode Podcast crew discusses some of the exciting developments in THREE tournaments that are in their finishing stages: The Fall Tournament which wraps up this week, the Challenge Cup which will end soon as well, and the SMZ3R 1v1 tournament, which has just concluded. The crew also checks back in on the Reddit Plando tourney and briefly weighs in on a recent mandate about voice chat during weekly races. FEATURE: timp, Axeil, & Hurfydurfy wade through the time sink known as Misery Mire, aLttP’s penultimate crystal dungeon. Yes, you’re seeing this correctly. The Go Mode Crew really does spend about two and a half hours talking about Rando this time, taking time to check in on all the current tournaments, including the Fall Tournament, Challenge Cup, the SMZ3R 1v1 Tournament, and a new Plando-inspired tournament starting up on Reddit, as well as answer some Fetch Questions. FEATURE: timp, Axeil, & Hurfydurfy plunge the icy depths of aLttP’s 5th Crystal Dungeon Ice Palace. timp, Axeil, and Hurfydurfy all shake the magic holiday powder off and get back to business—Rando business, that is! After an exceedingly heady conversation about aLttPR Life Lessons, the crew catches quick updates on the Fall Tournament and Challenge Cup and turns to a special correspondent on the scene to cover a third tournament: the AGDQ 2019 2v2 Tournament. FEATURE: The crew hits the big city and dispenses some vigilante justice against Blind in aLttP’s 4th Crystal Dungeon, Thieves’ Town. The Go Mode Crew had to take a break from recording together due to some year-end traveling, so this one’s a shorty, and it’s just timp this time. timp knocks out our final two Fetch Questions of 2018 and lists a few of his Rando Resolutions for the new year. What are some of your #RandoResolutions for 2019? Reach out and let us know! 10 – Skull Woods + Fall Brackets Begin, Group Round Quirks, & SANTA! Ten! Zehn! Kymmenen! timp, Axeil, and Hurfydurfy celebrate this double-digit milestone the best way they know how: Talkin’ Rando. Join the Go Mode Podcast crew for a closer look at the beginning of the bracket stage of the Fall tournament and a discussion about some, erm, quirks with the group qualifier method, as well as a brief Challenge Cup update. And I guess timp and Hurf have been good this year because a special visitor drops by! FEATURE: The crew goes exterminating as they blaze a trail through aLttP’s 3rd Crystal dungeon, Skull Woods. In Episode 9, timp, Axeil, & Hurfydurfy catch up on the latest Fall Tournament standings, share a personal story or two about volunteering in the Rando community, and highlight another cash tournament involving aLttPR: The SMZ3 1v1 Tournament. FEATURE: The Go Mode Crew wades through the Dark World’s 2nd Crystal dungeon Swamp Palace. 08 – Prize Pack Vol. I: Quizzes & Questions! Their eyes still adjusting to the harsh light after emerging from Palace of Darkness, timp, Axeil, & Hurfydurfy elect to take a brief respite from dungeoneering in order to test one another’s Rando knowledge and catch up on some listener questions. Join timp, Axeil, & Hurfydurfy as they begin coverage of the Fall Tournament’s Group Rounds, discuss v30.3 updates (as well as a veeeeryyy spoooooky festive update), and turn their attention towards the new Challenge Cup Tournament. FEATURE: The crew shines some light on the first Vanilla Crystal Dungeon Palace of Darkness. On Episode 6 of the Go Mode Podcast, timp, Axeil, & Hurfydurfy dish on the FallifiersTM, including scores, bizarre seeds, and more, then change gears to share some of their Rando life advice as it relates to overcoming both burnout and ’tilt’. Finally, we end things with another “listener” question & a special shout-out. 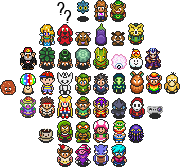 FEATURE: The crew (reluctantly) turns their attention towards the Dark Wizard of Hyrule, Agahnim. timp, Axeil, & Hurfydurfy return to their dungeon delving ways in Episode 5, but not before taking some time to discuss the Fall Tournament Qualifiers AKA FallifiersTM, v30 impressions post-launch, and The Joy of Z3R Simulator. Plus more listener questions! FEATURE: The crew climbs their way to the top of Vanilla aLttP’s final Light World dungeon Tower of Hera. timp, Axeil, & Hurfydurfy, joined by the creator of aLttPR Veetorp, pick up coverage of the recently concluded 2018 Summer Tournament, The FallifiersTM, and v30 sprites (for real this time). FEATURE: Veetorp sits down with Go Mode to discuss v30, the history of aLttPR, and the future of Randomizer. timp, Axeil, & Hurfydurfy provide updates on the Something Awful Community Tournament, the Fall 2018 Tournament, & the Summer 2018 Tournament, respectively, followed by reactions to some of the sprites to be included in the upcoming V30. FEATURE: The crew braves the searing heat to raid Vanilla aLttP’s second pendant dungeon Desert Palace. Join timp, Axeil, & Hurfydurfy for an update on the 2018 Summer Tournament qualifiers plus a discussion of smaller Randomizer communities and their tournaments, including the Something Awful Community Tournament. FEATURE: The crew takes a walk through Vanilla aLttP’s first pendant dungeon Eastern Palace. In the first episode of The Go Mode Podcast, timp, Axeil, & Hurfydurfy share their thoughts on the recently concluded 2018 Spring Tournament, as well as the upcoming Summer and Fall Tournaments. FEATURE: The crew talks through the first dungeon in Vanilla aLttP, Castle Escape. 00 – You Are In Go Mode! 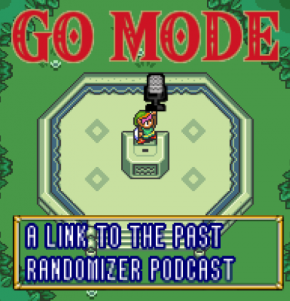 Join Go Mode Podcast hosts timp, Axeil, & Hurfydurfy as they introduce themselves, talk about their experiences with aLttPR, and discuss their plans for the Go Mode Podcast.